« Tide vs. Irish, Part 1: Rudy or Gump? Once I was soldiering through a rough summer, jonesing for college football more than usual, and since I’d already read all the preview magazines, and since there are as yet no biographies of Wake Forest football coaches, I bought a copy of The Last Coach, Allen Barra’s acclaimed biography of Bear Bryant. From this book I felt I learned a great deal not just about Bryant and Alabama football, but about the South, and America in the middle of the American century. Hell, a couple of times I even felt like Bryant was giving me a pep talk from beyond the grave, asking me what I was made of, challenging me not to quit. And now I might as well tell you the rest of this story, which I promise you is true: About a month after I finished the book, I met a beautiful woman at a book convention in Atlanta. When I learned that she was from Birmingham, and a rabid Alabama fan, I thanked Jesus and my reading muse for this little bit of lucky timing. I said, Why, I just read a biography of Bear Bryant, a fantastic book called The Last Coach. Do you, by any chance, know this book? She did, indeed, she said. Turned out, she knew it better than all but a few. Turned out that the author was – is – her uncle. Three years and two weeks later, she became my wife, which is how I came to find myself in Tuscaloosa on a September Saturday (roughly 5 years to the day after we met, by the way), walking down the Strip, drinking beer at The Houndstooth, continuing past the stadium and into the boundaried swarm of the campus proper. We ate barbecue and chicken wings. She toured me around the Quad, from Denny Chimes to the Gorgas Library, wanting me to take in the full array of Tide Nation. She said that tailgating on the Quad was once like a land rush, a frantic race to stake your claim days before the game. Now, it seems, the Quad is chalked and platted into lots bought and paid for, most of them by banks and law firms and white-collar businesses. 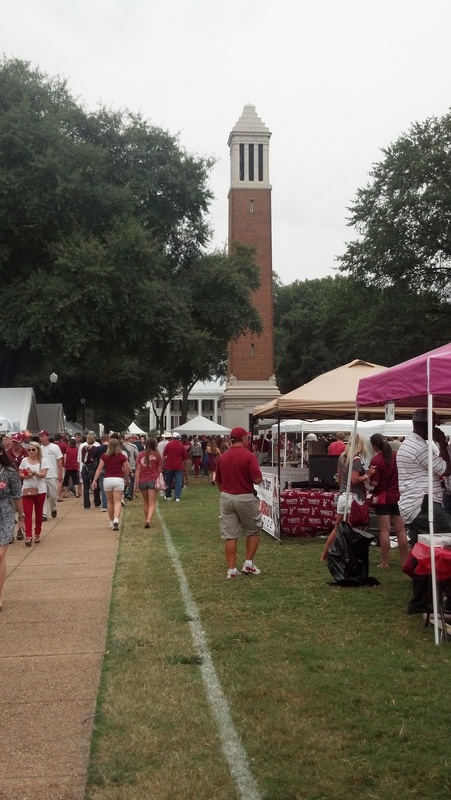 Other businesses cater to the tailgaters, either literally by delivering food in a golf cart and drinks chilled in locked coolers, or figuratively by erecting a tent and hooking up a satellite TV (to watch other, lesser college football teams). The effect is less Wild West and more well-ordered, prosperous subdivision; I would like to be here in the early, early morning, when the tents go up. After a couple of hours we walked back to the stadium to see the team come off their buses, to watch, from the back rows of the deep and plaintive crowd, the tops of massive heads take the Walk of Champions, past the bronze pagan statues of the five coaches – including the one at the head of this walk – who brought the nation’s championship back to Tuscaloosa. I have found that there are two versions of the next verse. My wife always thought it ran, “If a man starts to weaken, that’s a shame.” Others say that the original lyrics are, “If a man starts to weaken, that’s HIS shame.” My wife decided she likes this second version better. I have been warned. The band left the quad and marched into the stadium, and we joined the thousands following in their wake. I am not an Alabama fan; I am a fan of the Alabama football team, and there is a difference. Mainly I am a big fan of my wife and her family; I love them all fiercely, and, also, I am not dumb. My own allegiance presents no conflict, and won’t without a miraculous rise or a stunning fall by one team or the other. For this game I insisted on wearing a shirt in my team’s colors, but with an Alabama ball cap. I wore that cap honestly, as family and not as a craven frontrunner climbing on the bandwagon, even if I’m not an Alabama fan. Lord, though, it is seductive: all this history, this hegemony; to be invited into this community, sealed and marked with its own language that’s both private and famous; to be invited into all this confidence, all the downright certitude. This is the tribal pride, the yawping barbaric gallantry, the “proto-Dorian bond” of the South, rendered joyful and (mostly) harmless and transracial and (so, so often) triumphant. All that winning. All that glorious past. 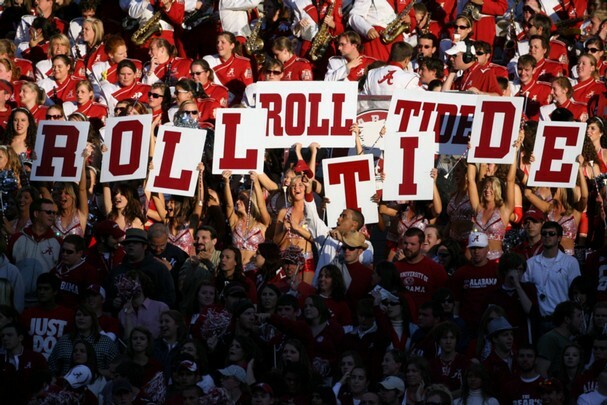 Never mind the sound of it – the very notion of 100,000 people yelling “Roll Tide, Roll” in unison, without mechanical prompt or reminder, astounds. The University of Alabama football team has stood as a symbol of so many things at so many times, and so often at the same time, that if they didn’t keep winning we might lose sight of the ball: They were the standard-bearers for downtrodden Dixie; they were the champions of segregation and white oppression. To other, older parts of the South, they were a collection of country boys with names like Lee Roy, to be mocked and/or envied; within the state, they play for the school for the moneyed elites. To the sports media, they are a juggernaut of excellence, the New York Yankees of college football, joyless in their grim perfection and lofty expectations; to their fans, they are the focal point around which the seasons turn. In our seats high above the north end zone, my wife got teary-eyed watching the pre-game history lessons on the video boards. First, the survey course, on Alabama football through the ages, from when the game crossed the Black Warrior River onto campus in 1892 through all 14 of their national championships, including – especially – the one won last year. Then, soon after, the seminar, on the man who coached the Tide to six of those titles, the man remembered everywhere here by name and by fabric pattern. You could call it a Bear-haunted landscape, except that his presence is too blatant to be a haunting. The video board shows a clip from one of his locker room speeches, and 50 years on, he’s still the most charismatic man in the state. Nick Saban is compelling in his relentlessness; he tricks you into thinking that you, too, could enjoy his level of success, his excellence, if you could just focus as narrowly, work as hard, be as single-minded as he is. Saban benefits from having the job three decades after Bryant died, and he has won enough that his relentlessness has become a kind of charisma. But the first time I came to Birmingham to meet my future wife’s family, I came for a wedding in which she was maid-of-honor, and the groom’s cake was topped with an edible and frosted houndstooth hat. The groom, by the way, would have been in diapers when Bear Bryant died. Tonight Ole Miss becomes the first team all season to hold a lead on Alabama. They hold that lead for all of 15 seconds. Alabama wins over the course of the night, and I mean that exactly. This year’s team, perhaps more than any other ever, really does resemble a Crimson Tide: Alabama’s third-stringers could start for all but a few Division I teams, and for all Saban’s brilliance, he does seem simply to throw wave after wave of superior talent at the opponent. Saban’s other mantra is “Do your job,” the idea being that if each player does his job, and focuses laser-like on his small role within the grand mechanics of the game, then “the process” will proceed without hitch or hindrance, and victory will roll in as surely as the . . . well, you know. Because Nick Saban and his staff and their players are so good at what they do, “the process” proceeds as envisioned far more often than not, and that much winning can’t help but be fun. What it may lack in lyricism, it makes up for in effective competence, and effective competence is an undervalued virtue these days. Thanks, Rebecca. Glad you enjoyed Serena; you ought to read One Foot in Eden next.